Looking for more information about credit scores? You have come to the right place. We’ll outline the important details about your credit report, including the information included in your Experian credit report, what your score means, ways to improve your score, and more. What is the Experian credit report? Your credit score is important — but do you know just how important? There are few numbers that have the same impact on your everyday life as your credit score. Your credit score impacts everything from how much interest you pay on your credit cards to whether or not you will be approved for a loan to buy a new car. Your credit score is a direct reflection of the information found in your credit report — things like your payment history, missed or late payments, your total debt, and more. What’s more, you even have multiple versions of a credit report. Each of the three major credit bureaus; Equifax, Experian, and TransUnion, have their own version of your credit report — and each can possibly contain different information. For this article, we’re going to explore your Experian credit report. Experian is a major consumer credit reporting agency. The company collects and aggregates consumer information on more than one billion individuals and businesses worldwide (including 235 million individual US consumers and more than 25 million US businesses). Experian is based in Dublin, Ireland and currently operates in 37 countries worldwide, with headquarters in the United States, the United Kingdom, and Brazil. In addition to credit services, Experian sells business services, including analytic and marketing assistance. It also offers direct-to-consumer services, including online access to your credit history and products designed to protect you from identity theft and fraud. Along with all other credit reporting agencies, Experian is required by United States law to present an individual with one free credit report every year, upon request. Why is your Experian credit report important? What’s more, the information contained in your credit report can actually affect the outcome of each scenario above, so it’s important to stay on top of your credit reports to make sure that the information they contain is accurate and up-to-date. If you’re unsure of your credit score, or have never checked your report, you’re not alone. 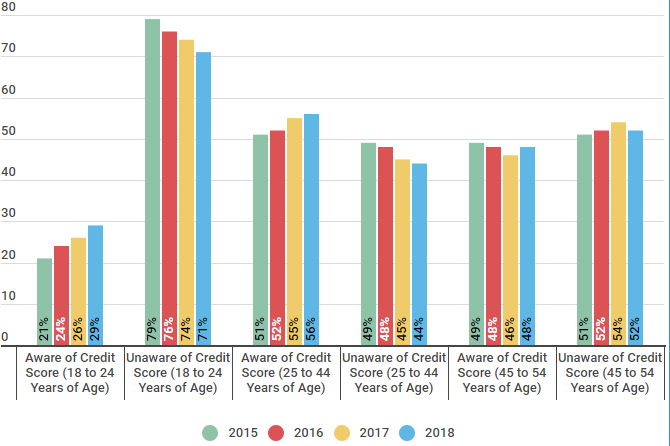 Below you can see that nearly half of 25 to 44 year olds were unaware of their credit score — and even more of those surveyed ages 45-54 were in the same position. Source: We surveyed 200 participants in each age group, total of 600 participants, were recorded on 9/25/18 the studies were completed and recorded. When you know your credit score, you can make informed decisions about your financial future — or take steps to improve your score, if necessary. With that understanding, let’s take a closer look at some of the details of your Experian credit report. While the FICO Score is arguably the most recognizable credit scoring model, the three main credit bureaus —Equifax, Experian and TransUnion— created a “more predictive scoring model” in 2006, known as the VantageScore model. A good VantageScore usually means you also have a good FICO, but the different factors that make up your credit score (and the impact each of those items have on your score) are a bit different. Length of Credit Use & Variance of Credit. The age of your credit history, as well as the variation in your credit, accounts for a portion of your credit score. Always keep your oldest accounts open and in good standing, and make sure your credit report reflects different types of credit (e.g., credit cards AND an auto loan). Balance. Your current credit balance also plays a part in your credit score. Keep the balances you carry as low as possible to see the best score. As you can see from the chart below, each of these factors are weighted differently than with FICO — meaning they each contribute to your score calculation in a different way. Payment history is clearly the most important at 41 percent, while your available credit, balance information and new credit applications, while still important, have a much smaller impact. So, now you know the factors that contribute to your score, but do you know what your score actually means? In other words, it’s one thing to know your score, but it’s another thing entirely to understand where that puts you among your peers. 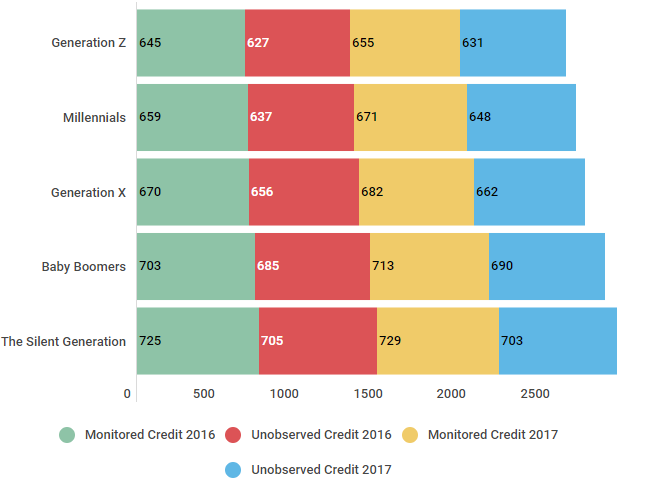 Let’s look now at the different score ranges for Experian — and also how you can use that information to help improve your score. Below are the credit score ranges that are generally attributed to Experian scores. The scores range from 300 to 850. 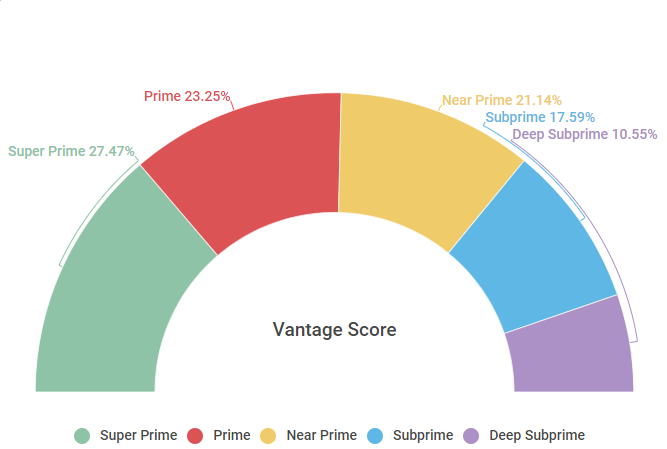 Those with a score between 500 and 600, for example, are generally considered to be “Subprime” borrowers, while those with a score of 781 or above are considered to be “Super Prime” borrowers. Lenders use the ranges above to determine a person’s creditworthiness. Lower credit scores result in higher interest rate payments, which no consumer wants. Lenders by extending credit to someone they feel is a risk, increase the amount of money they receive via interest paid. The good news is that almost everyone can improve their credit score with a little effort. How do I raise my Experian score? Clean up your credit report. Before you do anything else, request a copy of your Experian credit report. Examine everything in your report, looking in particular for any negative or inaccurate marks you can clean up. Dispute any errors you find with Experian. Make payments twice a month. Even if you pay off your balances in full each month, your credit card companies still only report data once a month — so this could still come back to hurt you. For instance, let’s say you have a $1,000 limit on a credit card that you use for bills — hitting your limit each month and then paying it off in full. There’s a chance your credit card company will report that you have a $1,000 limit AND a $1,000 balance — which translates to a 100 percent credit utilization. Making a mid-month payment will help prevent this. How were you able to raise your Experian credit score? I was growing out of my apartment. I did some shopping around and discovered that making a monthly mortgage payment would cost me less than my rent. At first, I didn’t understand why my Experian credit score was so low, but my friend explained that a lack of credit history impacts your score. I asked my landlord to submit my timely payments to Experian and I decided to get a secured credit card. What was your score previously? I paid for everything in cash until I realized I needed a good credit score to buy a house. When I got my credit report, I realized that I had some bills that wrongly went to collections which decreased my score. When collections is the only thing on a report, it does not look good to lenders. My credit score at its lowest was 490. Within eight months of establishing credit with my landlord and the secured card, credit card companies were sending offers for unsecured credit cards, I picked three cards with the lowest interest rates and kept my utilization below 30 percent. Three years later my score is 708. Margarette’s story is a great reminder to all of us that it’s important to check your report, to stay aware of your credit score, and to focus on building your credit history — and using credit cards responsibly is a great way to build your credit. TLDR; what you need to know about the Experian credit report? In conclusion, your Experian credit report is a compilation of the information gathered on you by Experian, one of the “Big Three” credit reporting agencies. Scores range from 300 to 850 — and the higher your score is, the better your credit is. There are a number of factors that contribute to your score, including your payment history, credit utilization, balances owed, length of credit use, number of new applications, and more. If your score isn’t where you want it to be, there are steps you can take to improve your credit, even in as little as 30 days. With responsible credit habits, any score can be improved — and you can enjoy the perks of better credit.